Amateur Radio is another one of my hobbies. 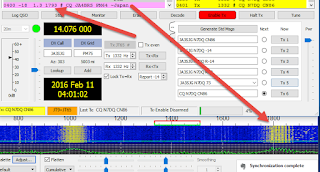 In January I found this new Digital Mode called JT-65, so far I have used it on 10 meters through 40 meters and listened on 6 meters and 80 meters. What is really neat about this mode is less power is more. 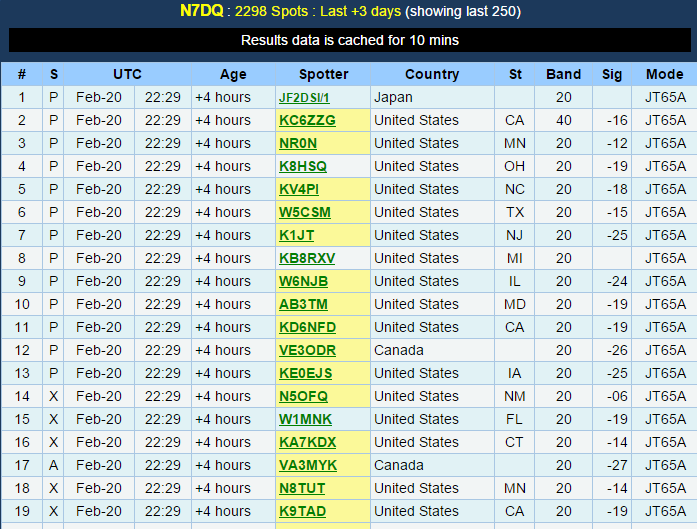 10 watts on 20 meters I worked Reunion Island from Longview, Washington and based on the signal report I could have probably used even less. I won't go into what JT-65 is, but since you can read tons about it here. WSJT stands for "Weak Signal Communication by K1JT." The mode is used for EME (Earth-Moon-Earth) communications, meteor scatter and HF/LF communications. Remember this is one minute for each phase of the QSO, well actually, 47 seconds sending the transmission and 13 seconds of listening, deciding what to do next. Look at the list of stations, decide which one you want to talk with, and click on the call and ensure you have transmit enabled. 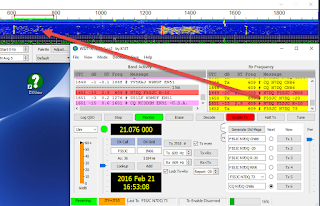 You can hear JT-65 on multiple HF and even VHF frequencies. The sound reminds me of music from a child's music box. This link provides a list of those frequencies and recommendations on Good Operating Procedures. Now your are thinking how do I try this mode out. First I am assuming you already are doing some form of digital communication from your computer through your radio such as RTTY or PSK31. If not, you will want to get a link between your computer and radio using something like a SignaLink USB or checkout and see if your radio can connect directly to your computer via a cable and do digital modes. You should need a simple cable that you should be able to purchase from your radio manufacture or the place you bought the radio. 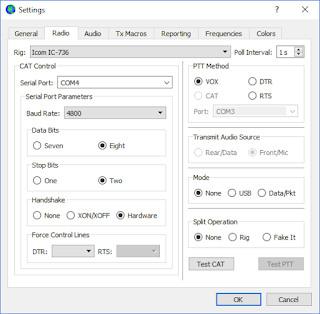 One other connection you might want to setup is Rig Control, this way you can use your computer to control your radio. Again, the cable should be available via your radio manufacture or your radio vendor. 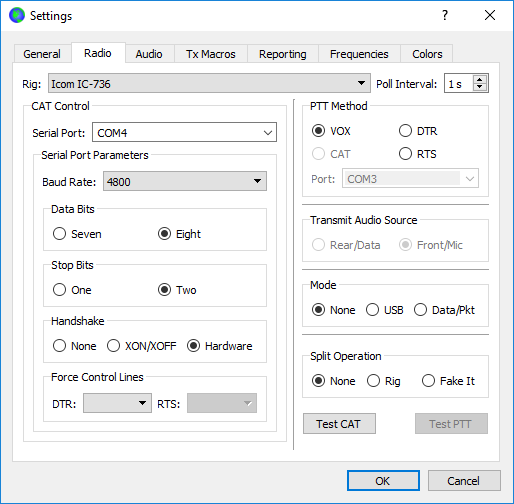 Search on Google for your radio and rig control or CAT, for example, "Yaesu FT-897 CAT" or "Kenwood TS-850 Rig Control" and you should find something to point you in the right direction. Now for the process to set things up. Your computer clock must be accurate to within a second or two. From my experience with Windows 7, 8, and 10, Windows only updates the clock about once a day and for some laptops the time drift can be big. First download Dimension4. It is a basic install, accept the defaults, once installed start it up and configure it to start on Windows startup. I have found that if you put your computer to sleep, having this running will help with time drift issues. Next, download WSJT-x (1.6). During the install it will ask some basic questions. There is a question about using hamspots.net, I recommend you take the default. While you run WSJT-x, it will report what stations you hear and the signal report you would give them. You can later change this to pskreporter.info if you want and if you want to see a map of connection go here. 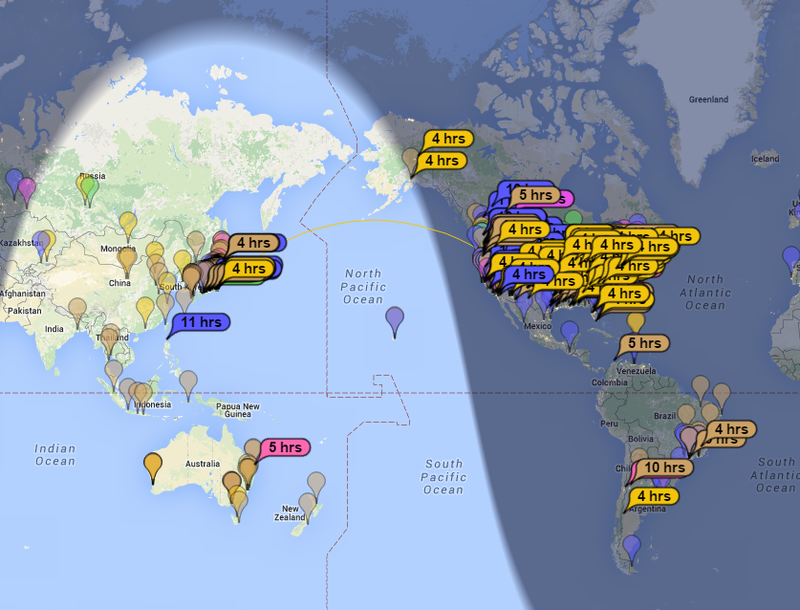 What is cool about this is you will see how far your signal can go around the world. Finally, download JT Alert - make sure you get the supporting applications as well. Install in the order downloaded. JT Alert provides an interface to some logs and helps you track needed contacts for state, country or grid. 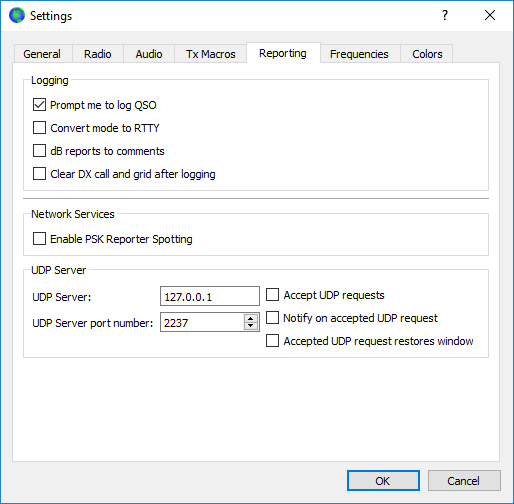 Start WSJT-x, go to File->Settings. Fill out the first tab with your information. 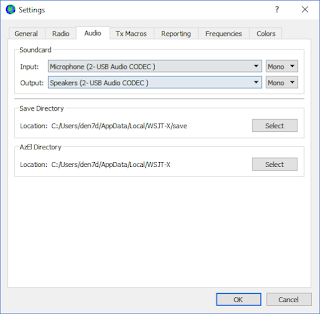 next go to the audio tab and setup the connection to your sound card interface. There are some other options that are beyond this simple article and you will some good setup directions out there. Read some of the docs for WSJT-x on setting things up, basically about 15 minutes, maybe 30 minutes or if you don't skim an hour. This mode and setup is easy, follow the quick guides and get on the air. Now make sure you started Dimension4, ensure it syncs your computer clock and is set to startup on booting the computer. 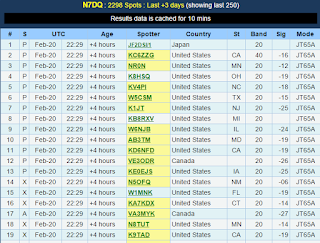 Start WSJT-x followed by JT Alert. Set your radio to the recommended frequencies in WSJT-x and listen, let the program decode. 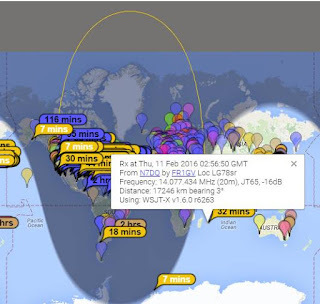 Focus on JT-65 not JT-9 at this time. Make sure you set your radio output power to no more than 10 watts, yes that is right 10 watts. More than that you will be splattering the band with noise and causing interference for other stations. If you are getting lots of -01 reports, you might consider decreasing your power. There is a site that will help you do a signal report and power comparison called dBCalc: Signal Power & dB Comparison. One other reason to keep the power low is that this mode is full key down during the entire communication. If you are using more than 50 watts or 100 watts, you could have some issues with your finals life span. 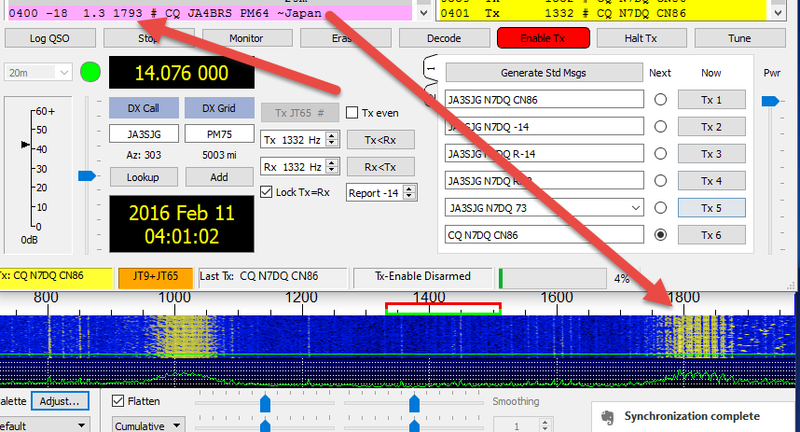 What I find interesting and cool is how well, WSJT-x pulls signals from the noise, here is an image of a station calling from Japan and for me is right in some noise either caused by propagation conditions, antenna issues, computer noise, radio noise or interference. You can even have signals that are crossed over each other see both QSOs. Though if two transmitting signals are exactly on each other you may not decode either and the music is not good. Go out to Youtube and do a search for WJST-x and find a couple of videos about operating in this mode -- probably should have told you this first but we are amateur radio operators and we try stuff before reading everything. 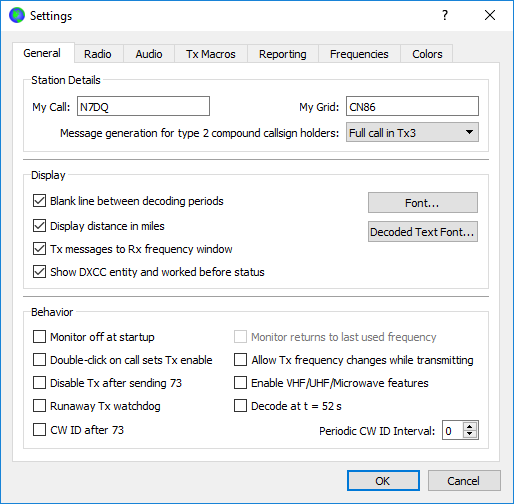 There are several other programs that do JT-65/JT-9 but I have found that I like the way WSJT-x works by keeping things simple. I have downloaded and used the programs and they have some pretty neat features as well. Here is a list of the other programs. JT Alert will interface to each of them as well, so you may need to reinstall JT Alert to configure it to see these programs. JT65-HF by W6CQZ looks like it is no longer available and the project is abandoned. Hope you give this mode a try and you should see me out on the air at some point. In this update article of Perl and Flickr Stats and Google Docs, I'll be covering how to change the final program to use Google OAuth2 for accessing the Google Spreadsheet. Please review the previous posts, especially number 4 in the series as I'll be referencing that code to add in specific changes for OAuth2. The reason for this update is that some time back around May and June of 2015, Google changed the requirement in using their APIs from just username/password to OAuth2. I did not notice this until recently and finally got time to update the access to Google Docs. The one thing I need to add to this program is some error checking so it can email me if an error occurs and I can deal with future issues sooner. The previous posts cover connecting to Flickr, pulling the data, authenticating to Google Docs and putting the data into the spreadsheet; Perl and Flickr Stats and Google Docs, Perl and Flickr Stats and Google Docs - Part 2, Perl and Flickr Stats and Google Docs - Part 3 and Perl and Flickr Stats and Google Docs - Updated for Google OAuth2. You will want to review the previous articles as they fully document what is happening and the setup for Google OAuth2 and changes to the main program. The setup for Google OAuth2 is almost like what you would do for the Flickr API Auth. In this case you need to get an account on developers.google.com, Once in, create an OAuth2 ClientID, I selected other rather than Web Application, and you will get a ClientID and a client secret to use in the program to get and save the authorization code. The base code I used was from http://stackoverflow.com/questions/30735920/authenticating-in-a-google-sheets-application and http://www.stackoverflow.dluat.com/questions/31527911/perl-using-netgooglespreadsheets-gives-error-in-libxml. Enter this code, update your Client ID and client secert, save the program and run it. # and used later to authorize our spreadsheet access. #    client_id and client_secret from Google. #    the URL in a browser to load the page. #    an access token from Google, and store the token. # id and client secret! # that can be used to update it as needed. 1. Copy the URL and paste it into a browser. access to the Google doc. 3. On the next page, click "Accept" when asked to grant access. left-hand column labeled  "Authorization code". Copy the code in that box and come back here. Token successfully stored in file $session_filename. load the token as needed for access to the spreadsheet data. Here is the program flickr-google-stats.pl, I'll be walking through the code below. # Class::MOP::load_class is deprecated at /usr/local/lib64/perl5/Class/MOP.pm line 69. Add lines 20, 21, and 22. They setup up the OAuth2 libraries and the Storable library. Add lines 78 through 101, they setup access to the saved authorization file, and the connection to Google Drive and the spreadsheet. Line 100 is the changed line 75 in the original program. If you have everything in place to start adding Flickr data to your Google Spreadsheet. Let me know if there is anything I missed or could improve upon here. 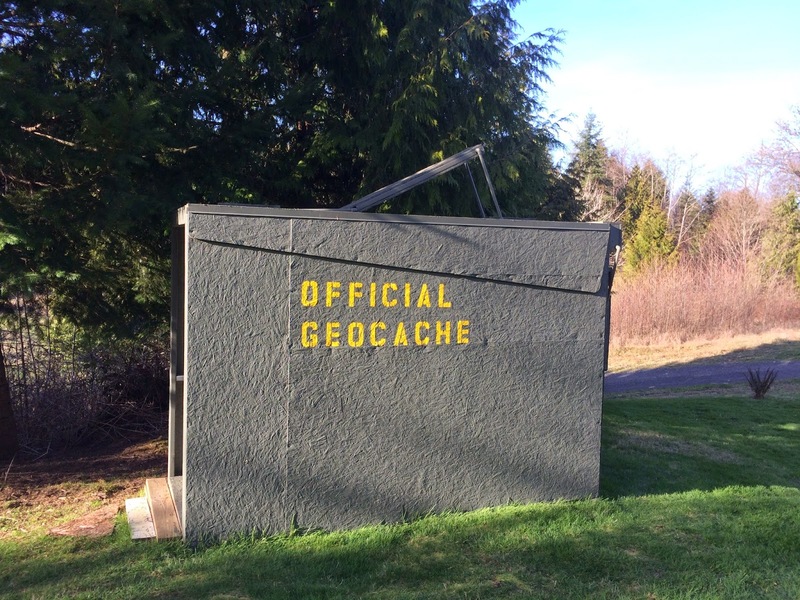 Well this weekend, February 14, 2015, I went out Geocaching with an iPhone 5s and the Geocaching app from geocaching.com and here is an assessment of my experience. It was pretty cool and it works with some effort. My geocaching experience level would be considered novice and I wanted to do something along with my going out to take pictures (something to get me outside even more.) So my first day out I found 5 of 9 that I searched for and second day 7 of 8, though 3 of these were ones I did not find the first day. Like I said, novice level. 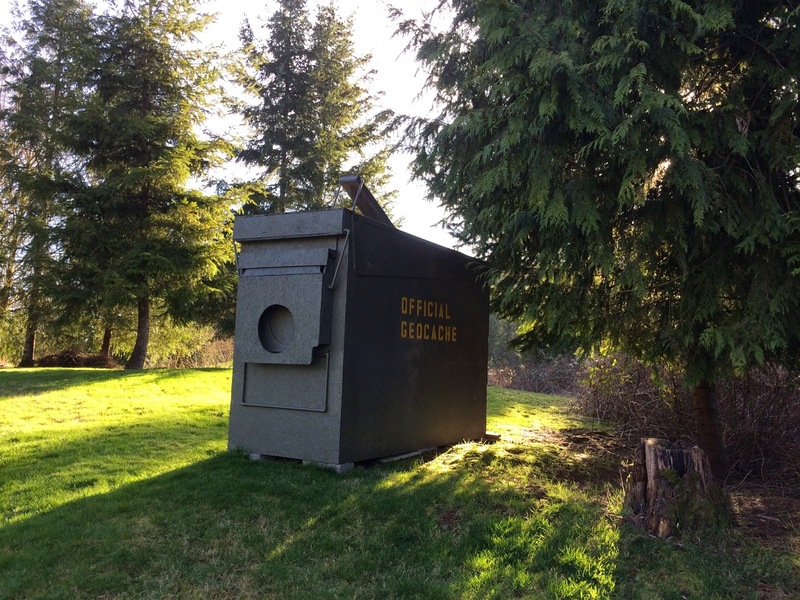 I had no clue how cache hiders really hid caches and learned the hard way by myself. Using the Geocaching app was very easy, I select local "easy" to find caches and there were lots of them. The first cache I found ended up being in the knot of a tree and the second a magnetic key-holder on a lamppost. Both of these were relatively easy. The iPhone 5s as a GPS worked fairly well. I found it would take me directly to the area of the cache and would actually try to take me straight to the cache. I wondered if would take me directly to the point of the cache and it would not. Best I could do was one foot and even then it was off a bit. I did validate the phone would not take me to a cache if there was no service which is what I expected. The approach that finally worked was to try and approach the cache from multiple directions and it would narrow down where I needed to go. Experimenting worked out pretty well. For the failures I had, well chock that up to inexperience. I had no clue about guard rail caches and with some tips I got from a friend and a bit of research via Google and the geocaching.com site, day 2 was much better with a higher success rate. One of the things I have learned is that the iPhone GPS can be a bit jittery. It is impacted by metal buildings and overhead power lines. I found using a regular GPS that these things were not a big a factor in reception. More things to learn though. Next thing to figure out is how to download GPS information on caches to my GPS and use that instead of the preloaded caches. You want to get outdoors, geocaching, photography and bird watching will get you there. In the Pacific Northwest you have assume bad weather, rain, fog, mist,and wind. (c) 2015 Mike Bates . Powered by Blogger.